Learn everything you need to know about choosing the right paddle board for you. When considering a stand up paddle board, there are many factors that you need to consider before choosing a SUP. Where you plan on riding, the type of riding, and paddler preferences all come into play. Learn everything you need to know about choosing the right paddle board for you. 1. Where Will You Paddle Board? Lakes, ponds & marshes typically have one thing in common – flat water. Flat water provides a great and easy environment to learn how to paddle board. 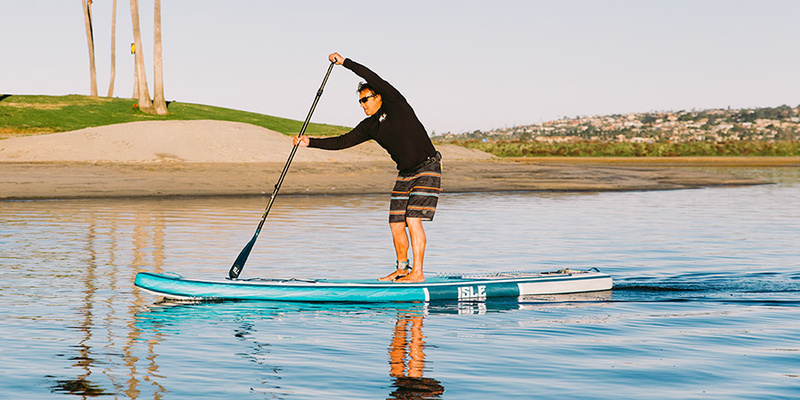 All Around SUP models are perfect for flat water environments because of their stability focused characteristics and as such are great for beginners and even intermediate paddlers. As their name implies, all around models are great for most conditions and are decently maneuverable. All Around Models are typically larger in width with a larger deck pad to match, and as a result are much easier to use. Bays, lakes and oceans provide an excellent opportunity to cover long distances and explore. Touring models are an excellent choice for intermediate and expert paddlers looking to travel longer distances more efficiently than traditional surf style shapes. The touring models feature a slight displacement hull, allowing them to glide on the water and carry more speed over long distances. If long distance paddling and exploring in bays, lakes or oceans is your thing, then touring boards are perfect for you. Looking for a paddle board to have a blast in the surf? Surfing SUPs are great for wave riding and are highly maneuverable due to their planing hull. A planing hull is wide, and tapers towards the edges of the board (like the bottom of a boat, but less drastic) and allows for banking and sharper turns. Ready to shred but with the easy of a paddle board? Shop our selection of surf models. Can’t pinpoint exactly where you’ll be riding your board or value being able to take it anywhere? An inflatable board is the ideal choice for you. Inflatable Paddle Boards offer a complete portable package at a price anyone can afford. When deflated, they pack down into the size of a sleeping bag and inflate in just minutes. 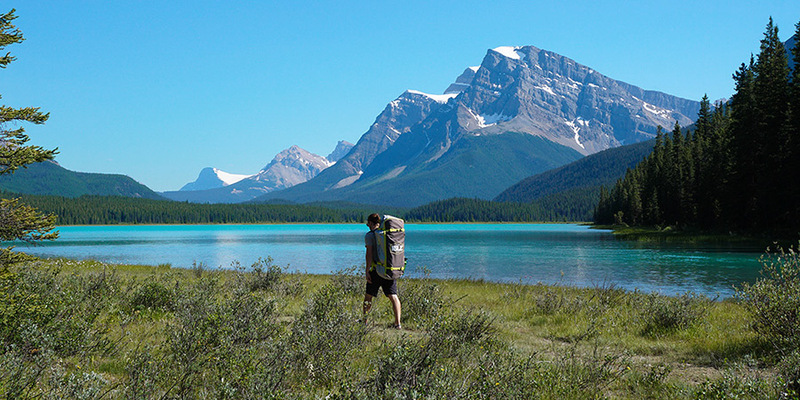 The true advantage of Inflatable Paddle Boards are their ability to be taken on any journey. 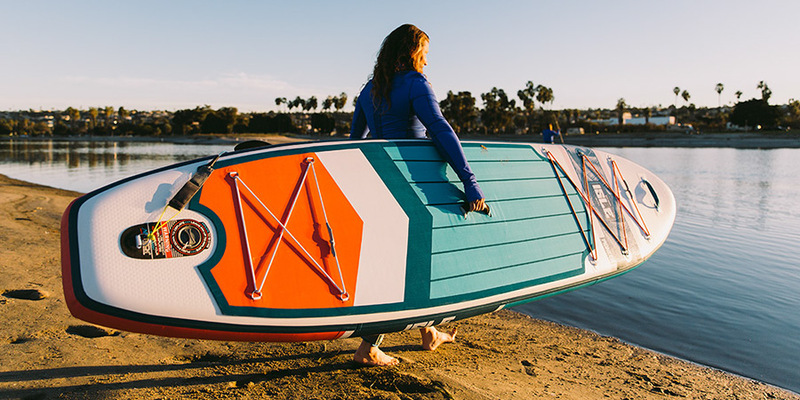 If you seek portability, durability, and value, this is your-go to paddle board – especially for beginners seeking an economical first time package. 2. How Experienced of a Paddle Boarder are You? 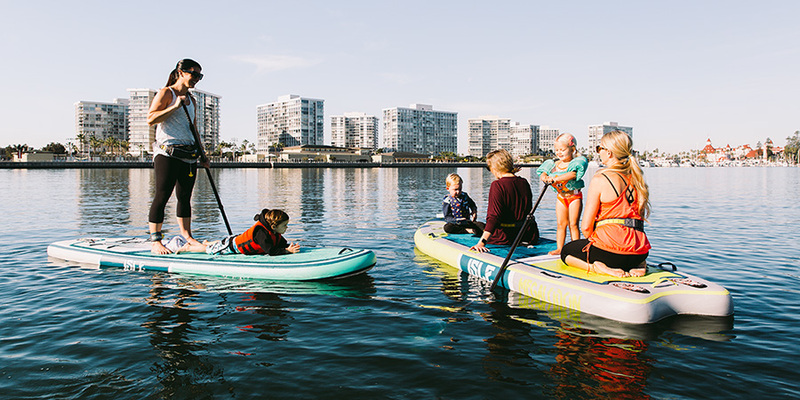 As a beginner your main goal is to have fun on the water and explore what paddle boarding has to offer. Calm waters provide the ideal conditions to learn – lakes, ponds and marshes. When it comes to choosing a paddle board style, beginners often prefer wider, more stable stand-up paddle boards. We recommend Inflatable and All Around SUP models as they are the most popular styles of beginner boards. 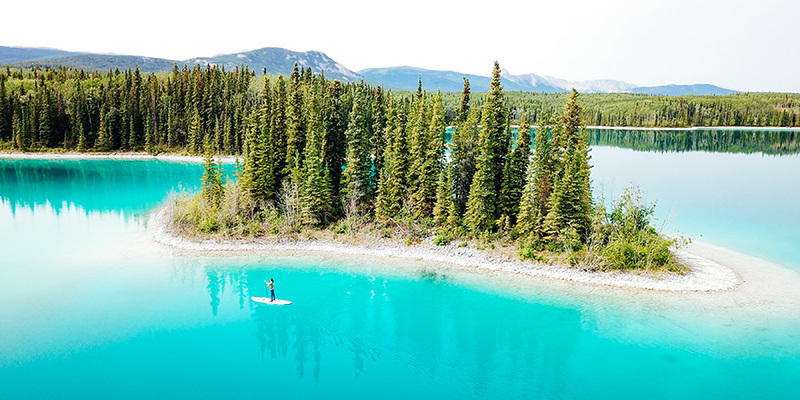 An experienced paddler has spent a considerable amount of time honing in on their paddle boarding skills and has identified their favorite locations to paddle. Some experienced paddlers are focused on efficiency. Speed, maneuverability and glide are just a few of the many factors they consider when choosing a paddle board. Other experienced riders use their board as an extension of their hobbies. For example, yoga and fishing SUPs provide their rider an affordable way to take their respective hobbies out onto the water. Whether in calm or choppy water, an experienced paddle boarder can handle it all, with the right board of course. Our Touring, Racing and Surfing SUP models are the most popular styles for experienced paddlers that focus on performance. Meanwhile, our Yoga and Fishing models are a nice way for the rider to get out onto the water and enhance their yoga or fishing experience. 3. What Size Board is Right For You? You want to choose a stand up paddle board that has enough volume (buoyancy) based on your weight and experience level to properly float you. If the paddler is too heavy for a SUP board, the board will sit lower in the water and thus create more drag, making it difficult to pick up speed. Tip: Remember to account for the added weight of the gear you plan on bringing as well. As such if you plan to use your SUP for fishing or long adventures, you’ll likely want to choose a SUP that’s more buoyant. It’s important to mention that being too light for a board is not something a rider has to worry about, as it doesn’t make a difference. Length, width, and thickness should be considered when deciding which size of paddle board is right for you. For more information, and a detailed way to calculate the perfect board size for your weight, use our SUP Size & Weight Comparison Chart. There are a few common fin setups you should be familiar with when choosing a paddle board. Many paddle boards will have one large fin directly in the back center of the board near the tail. This large fin which can range anywhere from 8″ to 10” in length, helping to track the board on the flat water or face of the wave while surfing. This is a very common type, and usually includes a large single fin 8″ to 10” in the center, and 2 small side fins 3″ to 4” tall on the left and right. The side bites help the board track better through turns while surfing on the face of the wave, and help the tail hold the wave face. Quad fins are 4 fins total, with a large and small fin mounted along the rail on both sides of the tail. Quad fins help the board drive in slow spots due to the lack of drag from a center fin, and also help the board grip and track on hollow waves since the fins are situated along the rail line. Now that you know how to choose a stand up paddle board that’s right for you, it’s time to get out on the water! 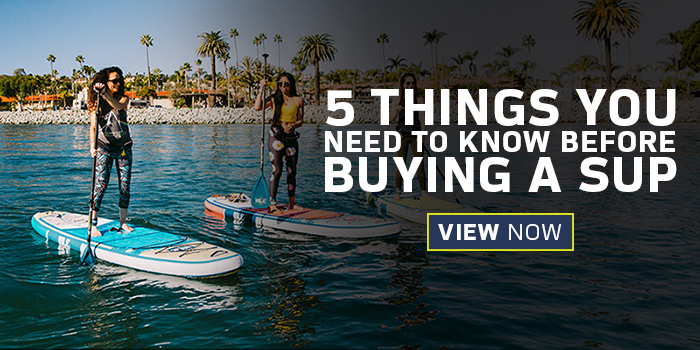 For more information, check out our comprehensive Paddle Board Buying Guide.